Find fun things to do in Solvang, CA. View our list of attractions, activities, events, restaurants and visitor information. The 2nd annual Solvang Grape Stomp harvest street festival. Currently as low as $99.00/night! 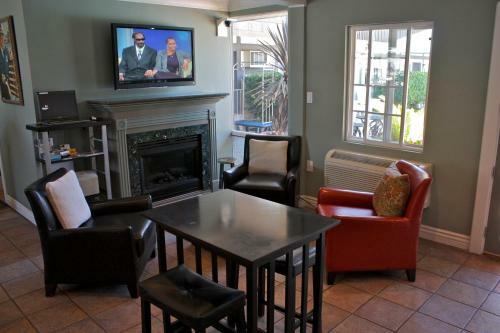 Set in Solvang 2.5 km from Shoestring Winery Atterdag Inn provides a garden and rooms with free WiFi access. Located around 3.7 km from Sunstone Winery the inn is also 3.8 km away from Kalyra Winery. Rooms come with a flat-screen TV with cable channels. Free Internet, Non Smoking Rooms. Currently as low as $295.00/night! Located in Santa Barbara Wine Country this B&B offers evening wine and appetizers. Guest rooms include free WiFi. A restaurant is on site and a full American breakfast is served daily. Free Internet, Restaurant, Non Smoking Rooms. Currently as low as $139.00/night! An on-site day spa restaurant outdoor pool and beautifully decorated rooms are just a few reasons Hadsten House Inn and Spa is a favorite with our guests in Solvang. Swimming Pool, Indoor Pool,Outdoor Pool, Free Breakfast, Restaurant, Non Smoking Rooms. Currently as low as $103.00/night! Free Wi-Fi free hot breakfast and an outdoor pool and hot tub are popular perks with our guests at Holiday Inn Express Solvang in the Santa Ynez Valley. This Holiday Inn Express has 82 non-smoking rooms some with balconies on three floors. Free Internet,Outdoor Pool, Free Breakfast, Non Smoking Rooms. Currently as low as $137.61/night! Hotel Corque is conveniently located in the popular Solvang area. Both business travelers and tourists can enjoy the property's facilities and services. Free Internet,Outdoor Pool, Restaurant, Non Smoking Rooms. Currently as low as $89.10/night! Free breakfast an outdoor pool and hot tub free high-speed internet and a location in the center of Solvang make our guests glad they chose the King Frederik Inn in Little Denmark. Free Internet,Outdoor Pool, Non Smoking Rooms. Currently as low as $108.45/night! Our guests can anticipate an outdoor pool and hot tub and well-appointed rooms with 42-inch TVs at Solvang's non-smoking Kronborg Inn. Free Internet,Outdoor Pool, Non Smoking Rooms. Currently as low as $110.00/night! Scenic surroundings Wi-Fi spa services and a scenic location near vineyards make the Meadowlark Inn a relaxing retreat in wine country. Free Internet,Outdoor Pool, Non Smoking Rooms. Currently as low as $108.50/night! This boutique modern inn offers unique air-conditioned rooms with free WiFi. Solvang town centre is just a few blocks away from New Haven Inn. Free Internet, Non Smoking Rooms. Currently as low as $93.00/night! Featuring free WiFi and an outdoor pool the Royal Copenhagen Inn offers accommodation in the heart of downtown Solvang 45 km from Santa Barbara. Guests can enjoy the free continental breakfast at the property. Free Internet,Outdoor Pool, Pets Allowed, Non Smoking Rooms. Currently as low as $87.20/night! Free breakfast free Wi-Fi peaceful gardens and rooms with antiques and marble tiles are sure to please at the non-smoking Solvang Gardens Lodge a three-minute stroll from Solvang Village Square. Free Internet, Non Smoking Rooms. Currently as low as $699.00/night! Set in Solvang 2 km from Kalyra Winery and 2.6 km from Sunstone Winery Stunning Private Ranch offers free WiFi. With mountain views this accommodation features a patio. Non Smoking Rooms. An outdoor pool and hot tub cable TV with HBO and high-speed internet make Svendsgaard's Danish Lodge-Americas Best Value Inn a hit with our guests. Free Internet, Swimming Pool,Outdoor Pool, Free Breakfast, Non Smoking Rooms. Currently as low as $71.10/night! Cheerful rooms with free Wi-Fi and flat-panel TVs along with the loan of free bikes for sightseeing and touring nearby wineries earn the Hamlet Inn high marks from our guests. Free Internet, Non Smoking Rooms. Currently as low as $155.35/night! Scandinavian charm combines with modern amenities happy-hour deals and a non-smoking central Solvag location at The Landsby. Non Smoking Rooms.